Huitzilopochtli, whose name means "Blue hummingbird on the left," was the Aztec god of the sun and war. 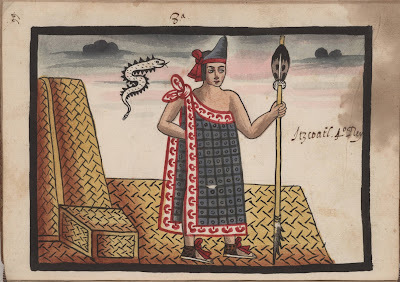 The turquoise or fire serpent (xiuhcoatl) was his mystical weapon. Chicomoztoc, which means "seven caves," the place from which the Aztec believed they came, was the Nahautl word for the mouth or womb. In the Aztec myth of creation, the Mexica left the bowels of the earth and settled in Aztlán, from which they acquired the name Aztec and from whence they undertook a migration southward in search of a sign for where they should settle once more. A god. A man wearing a yellow skin, conical hat, and three flags attached to his loincloth holds a shield with the five directions of space on it, a ceremonial staff, and a spear in the other hand. He stands in a mountainous landscape. The people of Tlaxcala, "Place of Maize Cakes," were a rival tribe to the Aztecs. They, too, had been nomadic Chichimecs. 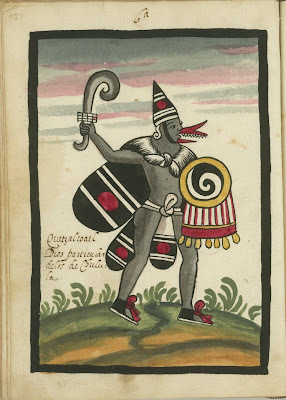 Their god of war, Camaxtli, here shown wearing a human skin and a conical hat like the Aztec god, Quetzalcóatl, had promised that they would rule the world. The people of Tlaxcala, not as successful as the Aztecs, eventually allied themselves with the Spanish against their ancient enemies. The Tovar manuscript is divided into three sections. 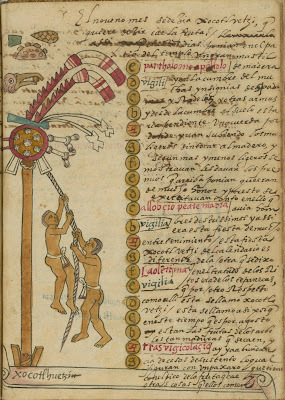 This second section of the manuscript--the text, with illustrations, of the history of the Aztecs--is essentially the same as the Codex Ramírez and forms the main body of the manuscript. Tezcatlipoca seated on a basketwork throne in his temple. He holds a shield with the five directions of space and three arrows, as well as a spear. 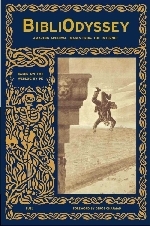 He wears a red cloak covered with skulls and bones and his hair contains white feathers. Tezcatlipoca, or "Smoking Mirror," was an omnipresent and omnipotent god, the god of the night sky and memory. 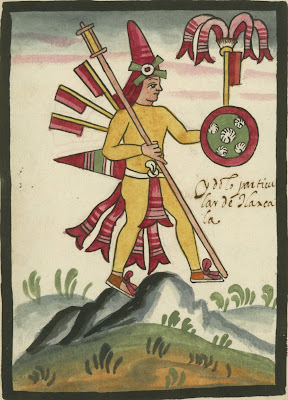 Here he carries the same shield as Huitzilopochtli, the god of the sun and war. The volutes on his temple represent butterflies or fallen soldiers. White feathers were placed in the hair of sacrificial victims. A mummy is shown seated on a basketwork throne with a feathered ornament made from quetzal plumes, a jade collar, and three men in background. The three men in the background represent the slaves who were sacrificed when an emperor died. A mummy is shown seated on a basketwork throne with the glyph of Auizotl, a crown, feathered ornament made from quetzal plumes, a jade collar, and three men in background. The mummy has blood coming from it. 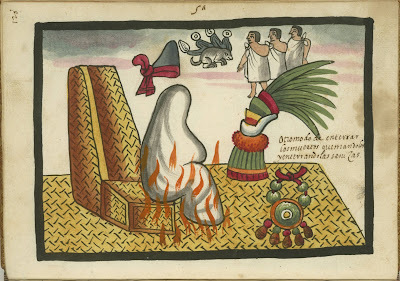 The mummy of Ahuitzotl, with his glyph and other symbols of his royalty, is shown in the second stage of the funeral rites of the Aztec, the cremation. The three men in the background represent the slaves who were sacrificed when an emperor died. Auitzotl, or Ahuitzotl (reigned 1486-1502), the eighth Aztec emperor, son of Moctezuma (or Montezuma) and brother of Axayácatl and Tizoc, enlarged the Aztec empire to its greatest size. A ruthless military leader, he suppressed a Huastec rebellion and more than doubled the size of lands under Aztec dominance. He conquered the Mixtecs, Zapotecs, Tarascans, and others down to the western part of Guatemala. Under his rule the main temple at Tenochtitlán was completed. 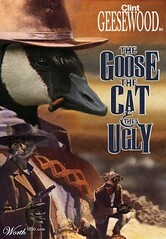 He died of a wasting disease. His funerary rites are described in the Codex Duran. Two goddesses. 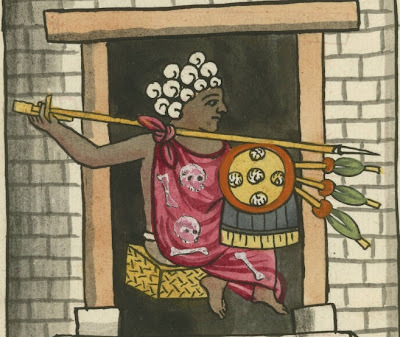 Toci or Tonantzin, "our venerated mother," with a bone through her nose holds flower plumes and wears quetzal plumes on her head. 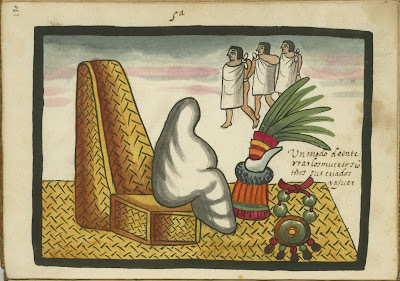 Xochiquetzal, "flower feather," wearing a jade necklace, kneels on a lake. Jacques Lafaye, the editor of the facsimile edition of the Tovar manuscript, claims the anonymous commentator has mislabeled the figure on the left as Toci or Tonantzin. Lafraye says the figure is Xochiquetzal who was the goddess of artists, love, earth, pregnant women, and the moon and is sometimes mentioned as being married to Tlaloc. He identifies the figure on the right as being Chalchiuhtlicue who was the goddess of lakes and streams and was also said to be married to Tlaloc, the god of rains. 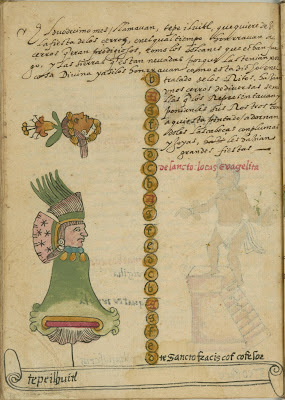 The Codex Durán contains an illustration of Xochiquetzal on the left and Chalchiuhtlicue on the right. Three priests carry offerings and walk beside a stream into which are cast decaptitated birds. All the men carry bags or pouches, one carries a staff and an incense burner, another blows on a conch shell, and the third wrings the neck of a bird. A flowering cactus rests on an island in the middle of the water. Under the reign of Ahuitzotl, Mexico suffered from a great drought. Ahuitzotl dammed the source of the Acuecuexco situated in Coyoancan. The decapitated doves were a ritual offering against drought. The priests wear necklaces of green stones or jade [chalchiuitl] and wear their long hair tied by with three red rings. 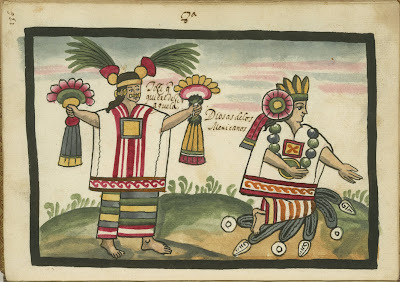 Two of the priests wear a headdress of flowers, one carries an incense burner with Aztec incense or copal [copalli]. The conch shell was often used in religious ceremonies. The symbol of the flowering cactus represents Tenochtitlán. Human sacrifice. An anonymous priest holding a spear presides over the sacrifice of a man whose heart is removed by an assistant. In the background, another assistant on the steps of a temple or pyramid holds an incense burner. The offering of the victim's heart to the gods satisfied the Aztec belief that the sun would rise again nourished by the hearts of men. 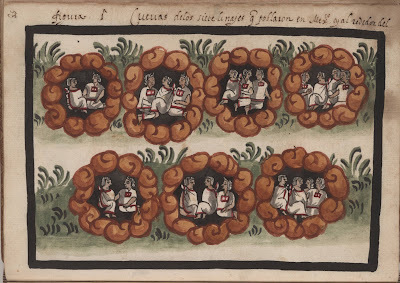 The "Flowery Wars" or xochiyaoyotl were conducted to acquire the offerings needed for the gods. 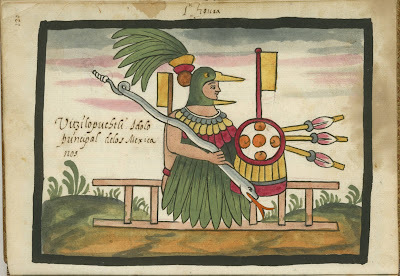 Quetzalcoatl, with conical hat, a beak, and feathered shield and cape, holds a curved knife. Quetzalcoatl, or Feathered Serpent, one of the principal gods of the Aztec, was a god of creation, linked to fertility and resurrection (his heart became Venus, the morning star), and rain in his manifestation as Ehecatl or wind god. He was often identified with Topiltzin, a legendary and possibly historic priest-king of Tula in the Toltec era and was described as light skinned and bearded. When Hernán Cortés arrived in Mexico in 1519, the Aztec emperor was convinced that Cortés was Quetzalcoatl. The design of his cape, hat, and loincloth represent the wings of a butterfly, symbol of fallen soldiers. Shows an episode during the war against the Chalco. Moctezuma I is shown sitting onhis throne pointing at the scene. Below him a soldier in yellow dressed in the feathered headdress of the nobility is being taken prisoner by the soldiers of Chalco. At right a prisoner dances on a platform while beneath him another prisoner lies with arm and head severed. At the far right a lord of Chalco sitting on a throne watches the dance with two of his subjects. At top center is the glyph of a flowering cactus representing Tenochtitlan or Mexico City. Military aspects include war clubs and shields. 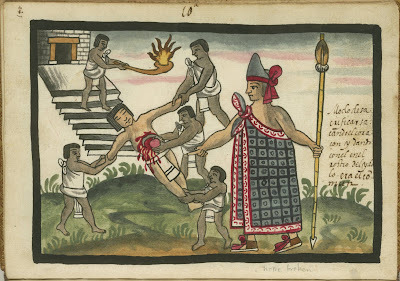 The hero of this story is Ezhuahuacatl, cousin of Moctezuma, whose story is told in the Durán codex. 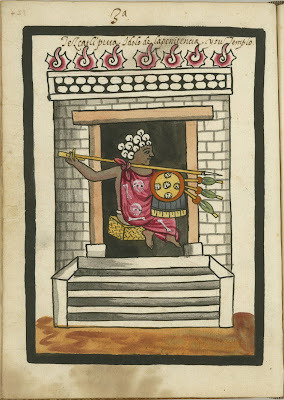 Ezhuahuacatl was offered the chance to become the ruler of the Chalco, but instead danced on a pole and threw himself off of it to his death to save his people from being slaves of the Chalco. Founding of Mexico City or Tenochtitlán. An eagle devours a bird while perched on a flowering cactus. The cactus grows from a rock in the middle of a lake. Footsteps of the Mexicans are shown approaching the base of the cactus. On the right is Tenoch (known from his glyph of a flowering cactus) who led the Aztecs to Tenochtitlán. On the left is Tochtzin, or Mexitzin (known from his glyph of a rabbit), from Calpan (known from the glyph of a house with a flag), Tenoch's co-ruler. The two rulers sit on basket-work thrones. At upper right is the symbol of Copil, son of Malinalxochitl, or five dots with crossed arrows, on a shield. 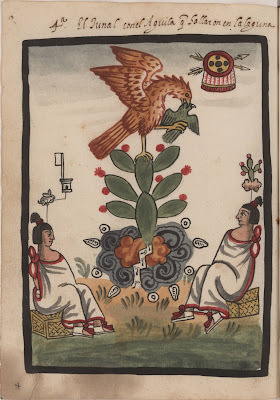 The Aztecs, guided by the prophecies of Huitzilopochtli (the god of the sun and war), ended their migration by building Tenochtitlán, on an island in a lake where an eagle held a snake perched on a flowering nopal cactus. The cactus grew, according to their mythology, from the heart of Copil, son of Huitzilopochtli's sister, which had been flung onto the island. His symbol of five dots represents the Aztec belief that the world was a flat surface divided into five directions (north, south, east, west and the center where their capital was located). Battle of Azcapotzalco. Two groups of soldiers fight with war clubs and shields at foreground of image. At the left are the combatants, at far left is a jaguar warrior, one of the elite soldiers of the Aztec, with the glyph of a flowering cactus above him; next to him is a figure representing Axayacatl (known from the glyph for water and hill above him). 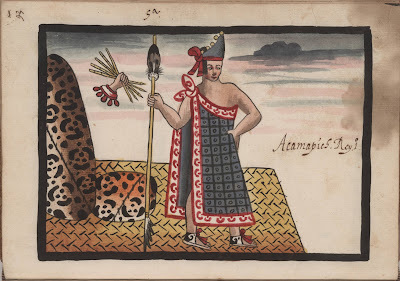 At the right is a figure in a conical hat and another jaguar warrior. Behind the soldiers is a dwelling with three women who make a sign of mercy with their hands. Another woman stands ready to defend them. At right an infant is being sacrificed by priest at a temple while two victims lie dead on the ground. Azcapotzalco, capital city of Tecpanec on Lake Texcoco, was the site of a battle in 1430 between Iztcoatl, the fourth Aztec emperor (who was allied with Netzahualcoyotl, a Texcocan lord) and Maxtla (son of a Tepanec lord to whom the Aztec had been subservient) who had had the previous emperor assasinated. Upon the defeat of Maztla, the three cities of Tenochtitlan, Texcoco, and Talcopan formed the new Aztec empire of the Triple Alliance. Itzcóatl (reigned 1427-1440), whose name means obsidian serpent, was the fourth emperor of the Aztecs. He is dressed in the clothes of the highest priests and is credited with destroying the old Nahuatl records, consolidating legal authority in a totalitarian leader, and with establishing the practice of "flowery wars" which were waged to attain human sacrifices. Acamapichtli, holding a spear or scepter, stands on a reed mat. Above him is a hand holding reeds. To the right are jaguar skins. Acamapichtli (reigned 1376-1395), whose name means handful of reeds, was a descendant of the Toltec emperors; his selection as the first ruler of the Mexico-Tenochtitlan dynasty gave authority to the Aztec rule. He is dressed in the clothes of the highest priests. The designs on his sandals are associated with Quetzalcoatl and his Toltec ancestors. The jaguar, along with the eagle and serpent, were potent symbols of Aztec religion. Hill of the grasshoppers. An emperor on a throne sits before the hill which is represented with a winding road and a spring. Military aspects include soldiers with war clubs and shields from three armies, feathered headdresses, and jaguar skin. Coatepec, the Toltec city in Tula, is represented by a hill with a serpent or snake on it. Water with leaping fish flows from the hill. On the right is Tenoch (known from his glyph of a flowering cactus), the legendary hero who founded Tenochtitlán. On the left is Tochtzin (known from his glyph of a rabbit) from Calpan (known from the glyph of a house with a flag). The two rulers sit on basket-work thrones. The Toltec civilization was already in decline in the 12th century and then was routed in the middle of the 12th century by the Aztecs who had left Aztlán and migrated to Tula. 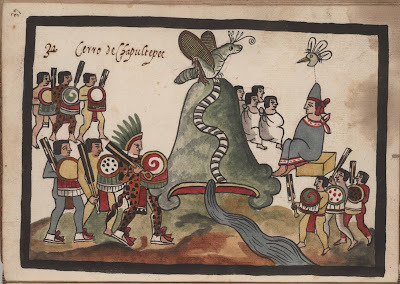 At Coatepec (meaning hill of the serpent) in Tula, the Aztecs perfected their technological knowledge and created the lake illustrated here at the suggestion of their god, Huitzilopochtli (the god of the sun and war). Dance of native Americans or Mexicans. Two drummers at the center wear the feathered epaulette seen in the portraits of the two Moctezumas. To the right of the drummers are the high priest wearing a tilma with the sun and soldiers representing the jaguar and eagle military caste. Decorative elements include feathered ornaments. 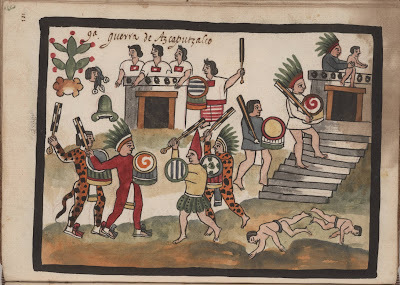 Dance of the nobles, perhaps for the festival of Toxcatl which was held during the month dedicated to Tezcatlipoca, or the god of the night sky and memory. 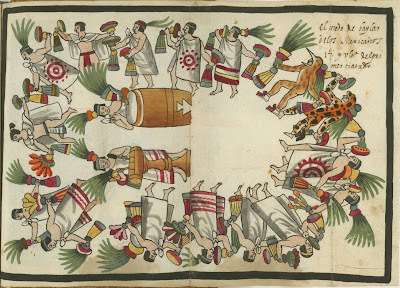 The drummers play the teponaxtli, or wooden drum, and the ueuetl, or drum with membrane. The nobles wear either the tilma or the more simple maxtlatl, or loincloth. Two boys climb a pole. 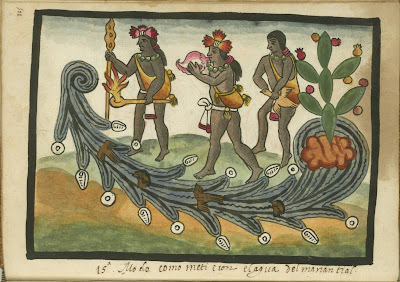 At its top are a shield with white feathers, spears, banners on serrated poles [from cacti], two flowers [xocoxochitl? ], and two bifurcated objects [teocuitlanacochtli?]. Above the pole are the head of a long-billed bird with a seed in its mouth, a loaf studded with nuts and resembling a starry night, an ear of corn, and a trapezoidal object. The text describes the festival as being of the Tepanecs. 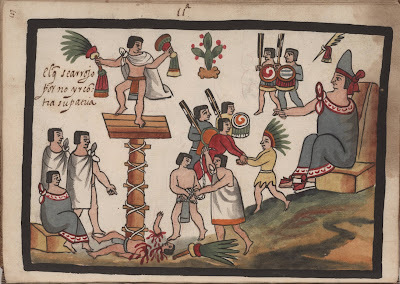 This month is called Fall of fruit or Hueymiccaihuitl (Great feast of the dead) and was commemorated by a ceremonial pole-climbing competition. This month was dedicated to Xocotl, the Aztec god of fire and the stars (also called Otontecuhtli whose cult was especially developed among the Tepanec tribes). Teocuitlanacochtli are associated with worship of the god, Xipe Tótec. A woman's head is shown upon the sign for a mountain. The head wears a headdress with green feathers and a necklace with blue beads and gold pendants. Above it is a recumbent head of a woman which is topped by a large flower and circled by golden feathers. The text describes the ceremonies honoring the hills in which representations of hills are adorned with faces. This month, identified as that of Luke the Evangelist, is called Festival of the hills. 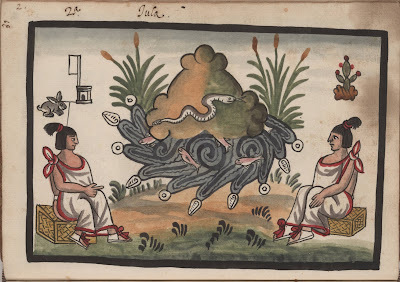 This month was dedicated to Tlaloc, the god of rain, but the headdress of the head upon the mountain resembles that of Xochiquetzal (Flower feather), goddess of the earth, love, artists, pregnant women, and the moon who is sometimes named the wife of Tlaloc. The recumbent head above her with its flower may also allude to Xochinquetzal. An old and emaciated man holds a banner decorated with blue stripes and pennants. 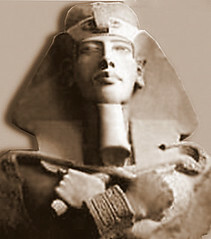 He wears a necklace of blue beads with gold pendants. Above the man's head is a goat. The text describes the month as being one in which the war captains celebrated. This month, identified as December with the astrological symbol of capricorn, is called Banner raising. This month was dedicated to Huitzilopochtli, the god of the sun and war. The blue color may be associated with this god whose name means "Blue hummingbird on the left." 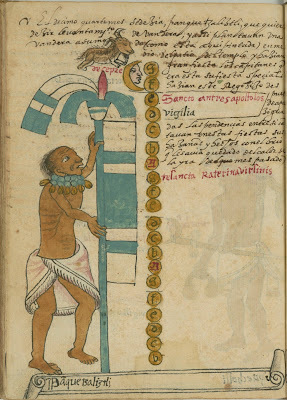 Aztec month, showing the name of each day of the month. 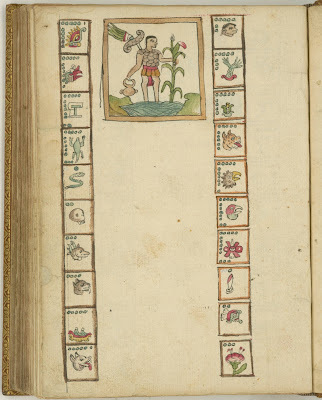 At the top is an image of a man with fish-scale torso and quetzal plume, standing in water and holding a stalk of maize or corn and a vessel. this is really quite fabulous. thank you! The seventh picture -another way of burying the mummy- it says in old spanish that they are burning it (and burying the ashes). There is no blood comming from it. Brings back memories of Precolumbian class, although that was mostly pre-Aztec. I will now be careful to avoid wearing white feathers in my hair, as life seems complicated enough of late without my prompting anyone to sacrifice me. I've just jumped in to the writing of my thesis. Dust is settling around the topic of urban underground comics challenging, well, in the case of Clément, la Historia Oficial (aka national history as it exists as a institution). Clément's art work and use of symbols reflects an understanding of Aztec Mexico. Essentially, your blog has helped guide my studies. You should check out his work - the influences are amazing. Thanks Kendra Lea. Although not realllly in my taste bracket, I do appreciate the artwork nevertheless. I'm glad you posted these graphs and comments on ancient cultures of Mexico. Another subject good to check is to view codex before the conquerors came. I hope you can post more of these. PaperJerry, did you check here? Great post, thanks for putting it together! this is simply marvellous, look how the drawings show expressions of figures. the people with the red patch on the chest are males, and females dont have a red patch. 6th fig depicts the girl's parents talking to her, convincing again. in the seventh i think, they take her away, see the look on the mother's face!! Your interest in the Aztecs led me to this site. Great job! First let me mention why I began my own study, and the reason for my comment. I was inspired by a theory first proposed by my father, the late Maya archaeologist Dr. Stephan F. de Borhegyi, that hallucinogenic mushroom rituals were a central aspect of Maya religion. He based this theory on his identification of a mushroom stone cult that came into existence in the Guatemala Highlands and Pacific coastal area around 1000 B.C. along with a grisly trophy head cult associated with the Mesoamerican ballgame. As a result of my study and solid evidence from other scholars, I now believe that Mesoamerica, the high cultures of South America, and Easter Island shared, along with many other New World cultures, elements of a Pan American belief system so ancient that many of the ideas may have come from Asia to the New World with the first human settlers. Judging from the wealth of mushroom imagery revealed in the art of the New World, I believe the key to this entire belief system lies, as proposed by R. Gordon Wasson, in early man's discovery of the mind-altering effects of various hallucinatory substances. The accidental ingestion of these substances could very well have provided the spark that lifted the mind and imagination of these early humans above and beyond the mundane level of daily existence to contemplation of another reality. The ideas thus generated included concepts of an alternate world with rebirth after death based on observation of the constant cycle of death and rebirth in nature. This included the predictable cycles of the Sun and Moon and veneration of the dualistic planet Venus based on its equally predictable cycle of death and rebirth as the Morning Star and the Evening Star. By the time the first native Mesoamerican religious texts appeared, whether in pictorial codices or, at the urging of various Spanish priests and chroniclers, in Spanish or one of the indigenous languages, there is evidence that this religion was identified with a supreme creator deity. This deity, seen early-on as a double-headed serpent with bird and feline attributes, was known by different names at different times and in different indigenous languages and culture areas. Over time he appeared in many incarnations, being associated with the planet Venus, the Sun, and the gods of rain and wind. Like the planet Venus, he has a dual identity and is probably best known by his Toltec/Aztec names of Quetzalcoatl/Tlaloc. Tlaloc, although most commonly thought of as a rain god, has attributes that merge with those of Quetzalcoatl and the Old God of Fire. Tlaloc's goggled eyes and feline fangs are not only depicted on other gods but also on ballplayers and warriors suggesting the mushroom-induced experience of "God within". All of this leads me to the conclusion that Quetzalcoatl and Tlaloc are not only dual aspects of the same god, but that they share their dualistic identity with Venus as both the Morning Star and the Evening Star. The two gods share the same temple at Teotihuacan representing the dual aspects of Venus, the sacred resurrection star of the new born Sun and all deified ancestors. I have chosen to call this ancient belief system the Mushroom-Venus/Quetzalcoatl/Tlaloc religion. Carl, thanks very much for your most interesting comment. For anyone following along: 'Breaking the Mushroom Code' copyright Carl de Borhegyi. That's a VERY big pageload Carl - you might consider putting it on a couple of web pages. Anyway, I will save the link and have a proper read when I have the time. The theory overview you give is fascinating and, in my ignorant opinion, entirely plausible. Thank you!